The J2 from Men in Black as a high-quality, die-cast prop replica! Features original studio sound tracks and light effects from the movie. 1:1 scale limited edition of 1,000 pieces! Includes a display stand, acrylic cover, numbered plaque, certificate of authenticity, and prop story booklet. No agent is safe from dangerous, hostile aliens in the world of the Men in Black movie series without one of these J2 Standard Issue Agent Sidearms. A sleek weapon carried by everyone from Will Smith's Agent J to Tommy Lee Jones' Agent K, the J2, or J-Gun, has been recreated as a full-scale prop replica. 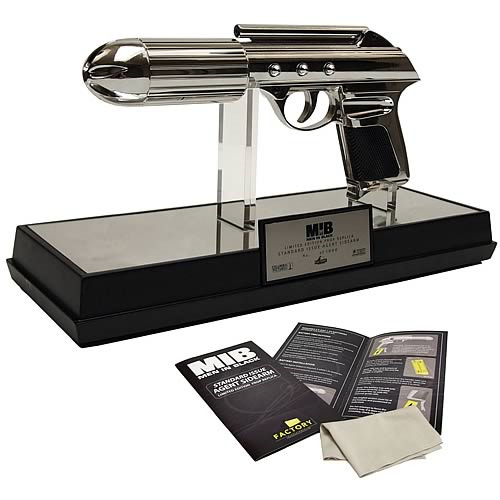 The Men in Black J2 Standard Issue Agent Sidearm Prop Replica from Factory Entertainment comes with a museum-quality display stand, acrylic cover, numbered limited edition plaque, certificate of authenticity, and detailed prop story booklet. It's a limited edition of 1,000 pieces that requires 2x "AA" batteries, included. Featuring sound effects taken directly from the original studio tracks and digitally isolated for clarity, the J2 gun also boasts light effects that include LED barrel illumination, a firing flash, and a red-and-green safety indicator. The reproduction is crafted from high-quality die-cast and machined-metal components which are then either polished or plated. For the first time ever, you can obtain your own officially licensed Standard Issue Sidearm Prop Replica. To ensure maximum authenticity, the Factory Entertainment Men In Black Standard Issue Sidearm Replica was created after exhaustive and careful study of the original props. The reproduction includes all the accurate details and features seen on the original props, as well as a number of added electronic light and sound features that were seen in the movie, but not actually part of any physical prop. They were instead added in post-production or with additional equipment and special effects. This has allowed creation of a self-contained replica that is faithful to the functions seen on screen, without compromising accuracy. A numbered limited edition of only 1,000 pieces, this version features double-chromed mirror-like plating to the gun body and rivet heads. The barrel section is polished machined aluminum, in keeping with the classic sci-fi look the film was seeking to emulate. The original props were initially highly polished to look like chrome plating, but this highly reflective surface proved problematic both on set and in production stills. So, various techniques were used to dull them down to reduce reflection and glare. The limited edition version seeks to replicate the original look and appearance of the props before any reflection or glare reduction took place, while still retaining a very durable and aesthetically pleasing finish.